I've never been shy on this blog about my general dislike of dark chocolate. Actually, that's not fair...given the option, I prefer all other types of chocolate over dark chocolate. If dark chocolate is the only chocolate available, I'll certainly eat it, but I'll just wish it was one of the other types of chocolate. Anyway, because of my lack of preference for dark chocolate, I've always stayed away from this Magnum Dark Chocolate Ice Cream Bar despite the fact that I've done reviews of all the Magnum ice cream bars with the exceptions of this one and the Mint one, which I've stayed away from for the same reasons as the Dark Chocolate bar. In my local Kroger recently with a coupon that allowed me to save if I bought two boxes, I picked up a box of this Dark Chocolate bar and also a box of the Mint bar, so that one will be forthcoming later. The sale price for this box was $3.00 and it contains three bars per box. Each bar is 2.7 ounces and contains 240 calories. Because this is a "high class" Magnum bar, it's made with rich Belgian chocolate, just like all the others. 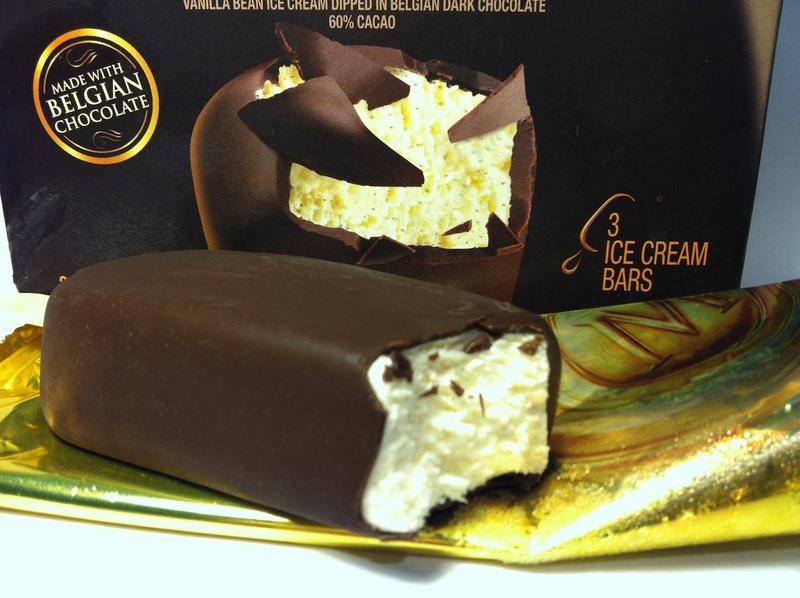 So, just like all Magnum bars, this bar is ice cream wrapped around a stick wrapped around whatever the flavor of the day is. In the case of this Dark Chocolate bar, this bar is a vanilla bean base ice cream encased in a hard dark chocolate shell. The dark chocolate certainly had that "flat" smell and the vanilla bean ice cream had small flecks of vanilla beans throughout. Being that I've had the other Magnum bars with vanilla bean ice cream before, I knew those beans would bring intense vanilla flavor. Since I already know what the vanilla bean ice cream tastes like based on my prior experiences (strong vanilla taste along with typical cooling aspect of wonderful ice cream), the real focus is on the dark chocolate and it delivered in every respect that you'd expect dark chocolate to do. The Belgian chocolate was very rich and thick as all of the Magnum bars are and while the chocolate was not sweet at all (again, this is dark chocolate), it certainly carried the typical flavor of dark chocolate. I wouldn't describe it as coffee like, but it was headed that direction. It certainly was a flat chocolate, but again, this was dark chocolate. What made this bar though was how the vanilla bean ice cream brought a degree of sweet flavor to counteract the dark chocolate in the shell. Eaten alone, the shell wasn't all that great. Mixed with the ice cream, it was actually quite good and I enjoyed it. Imagine that! Buy It or Fly By It? Despite my preferences for sweeter chocolates, I've got to admit that I found this appetizing and would give it a BUY IT rating. 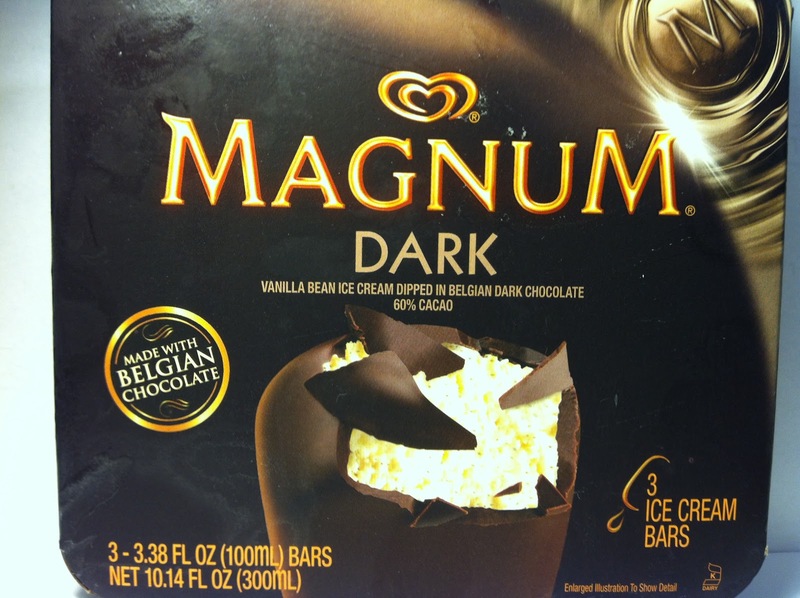 I'd buy the other Magnum products that I've had first, but if someone handed me one of these bars, I certainly not be upset and I'd definitely enjoy it. If you enjoy dark chocolate or at least don't hate it, I think you'll enjoy this too. I'm gonna take these babies home with me so as to alleviate the nagging feeling our busted dehumidifier gives us. This is such a perfect cold treat! Thanks!